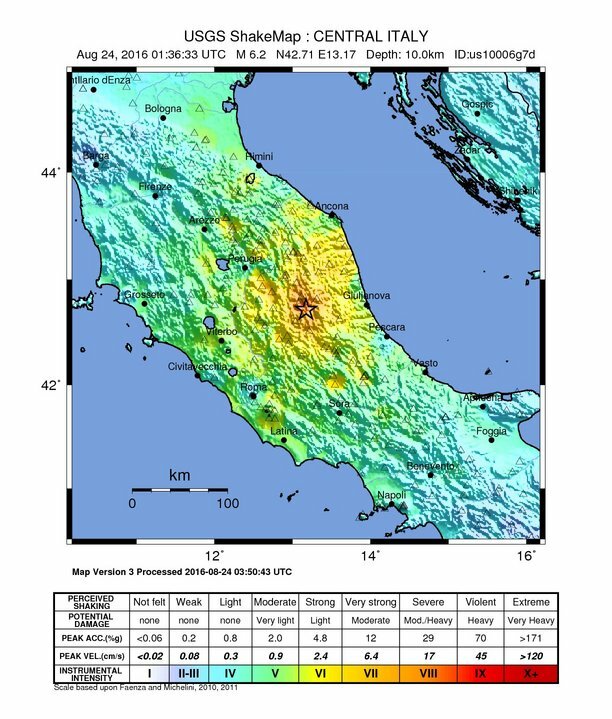 THE Salvation Army in Italy is making plans to respond to the earthquake on 24 August that brought devastation to the area around the towns of Amatrice, Accumoli and Pescara del Tronto, about 150 kilometres north-east of Rome. At least 240 people are known to have been killed in the quake, with many more yet to be accounted for. USGC tremor mapThere is not a Salvation Army corps (church) in the vicinity, but consideration is being given as to how best to assist people who have lost everything. Rescue efforts are being organised by the government's Civil Protection organisation, and the colonel is travelling to the affected region to meet with one of the group's officials and discuss how The Salvation Army can best help with the relief response. While in the area, he and Lieut-Colonel Anne-Florence Tursi will visit some of the worst-hit sites, although aftershocks are making some areas too dangerous to reach. One possibility is that the Italy and Greece Command will distribute blankets and basic necessities to the many people who refuse to leave their damaged homes. A mobile canteen has been offered for The Salvation Army to use, although it is not clear how quickly the vehicle will be able to be put into action. While the plans for short- and longer-term assistance are being worked out, Lieut-Colonel Tursi has arranged for The Salvation Army's guest house in Rome to offer free accommodation to 30 people who are willing to move out of the disaster area.